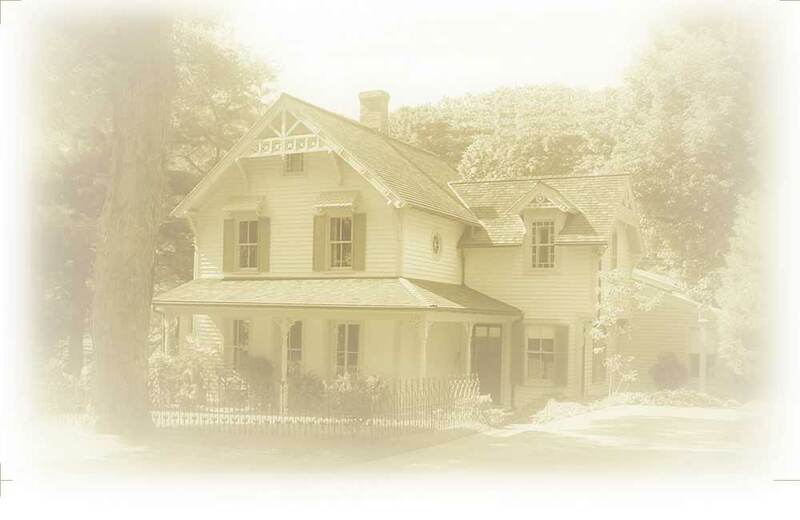 This home at 170 Pequot Avenue, Southport, Connecticut is a recently restored example of the Northrop Brothers fine carpentry and building in the Southport-Greeens Farms area. There is reference to this home being built for the Northrop brothers foreman or superintendent. It is right next to (left of) the home of George E. Northrop and family (and later his son, George I. Northrop and his family). Alvin Margaret Mary Never married. Helped raise nephew & neices especially once both parents died. David Alvord probably remains in the area for the rest of his life. All his children are reported to have been born in Kent, but I can't find him in census records. We don't know his profession, but there is a tradition of Shoe and Bootmaking in his line. His brother John manufactured boots & Shoes and employed other workmen in the northern part of Greenfield parish (Redding? Georgetown? Easton? Weston?) wife Elizabeth Bulkley "His wife was a remarkable woman for those days. She was passionatly fond of learning and embraced every opportunity to learn the news of the day. So eager was she, that frequently, after receiving the weekily newspaper, she would sit up almost the entire night to read." There appears to be some Weston connection was there a connection to the William Wakeman (underground railroad conductor) with the Alvords??? Right now these are only speculations...perhaps .. I've only found a census reference in 1790 Litchfield along with David's brother Elisha. Wakeman Alvord b. Sep 1802 Kent. died 20 MAY 1853 in Wethersfield, CT. He married Polly Jones 27 DEC 1820 in Kent, CT Resided Kent. Almon Alvord b. Jan 17 1804 Kent. died 30 NOV 1889 in Westport, CT. He married Ellen Thorp 20 SEP 1827 in Fairfield (Greens Farms), CT. She was born 8 JAN 1797 in Fairfield (Greens Farms), CT, and died 4 JUL 1876 in Westport, CT. Childred born Greens Farms. Nelson Alvord b. Oct 25 1805, Kent . Very successful Carriage maker in Torrington, CT. retired to Greens Farms,Westport, CT married Caroline Chamberlain Winegar 21 JAN 1829 in Kent, CT. She died Torrington 1847. . He married Adelia Millard Skiff 4 JUL 1858 in Torrington, CT. She died Westport 1880. Resided Torrington Wolcottville from ~1830 to 1863. Wolcottville played a part in Ct abolition movement, but no connection found to date. Sarah Wakeman Alvord b. May 23 1809, Kent CT. (my GG Grandmother) m. Alvin Northrop a shoemaker and possibly performing other leather work. David Alvord b. Kent, CT, d. Bloomfield, OH. A physician, resided at Poplar, Crawford Co., OH. b. Kent, CT, d. 1818, Kent, CT.
Abigail Jane Alvord b. Mar 23 1820, Kent. died 23 APR 1899 in Westport, CT. She married William Henry Hemson 8 OCT 1838 in New York, NY. Hemson was a carpenter/builder with some impressive Southport & Westport homes to his credit. He was born 23 MAR 1815 in New York, NY, and died 17 NOV 1897 in Westport, CT.
William Northrop1694 b. Milford a possible ancestor. In Fairfield by 1722. Bought land by Aspetuck River 1728/9. Children recorded Greenfield 1729 - 1743. Marriages recorded Greenfield 1744 Gilbert & 1745/6 Drew. 1725 Greenfield Hill residents assembled in a tiny building in 1725 for their first worship as the “Northwest Parish” which had recently been permitted to separate from the First Church of Fairfield. There were 13 men. 1729 Redding The first Society meeting was held June 5th, 1729-less than a month after the parish was organized.... The three first committee men of the parish, elected at this meeting, were John Read, George Hull, and Samuel Sanford. North Fairfield, a part of the town of Fairfield, was purchased from the Aspetuck Indians in 1670 for thirty pounds and an amount of trucking cloth. In 1762 the Connecticut General Assembly established the parish of North Fairfield. The Legislature in 1787 combined the parishes of North Fairfield and Norfield into the town of Weston. In 1845 the former parish of North Fairfield was divided from Weston and became Easton. In about 1757 people from Fairfield settled here. In October 1762, the Parishes of Greenfield, Stratfield and North Stratford petitioned to establish North Fairfield Parish. The town of Weston was set off from it in 1845 and the town was named Easton. Town vital records begin 1852. Following the Pequot Swamp war between the Native Americans and the English in 1637, Fairfield and Stratford were being settled by 1639. The city of Bridgeport, and the towns of Trumbull, Shelton, and Monroe were non-existent at the time as was the town of Easton. Parts of what were then Stratford and Fairfield, eventually became Easton and southern Redding. In 1667 The Connecticut Colony ordered a survey of the boundary of Stratford and Fairfield to settle land disputes. The northern boundary of Fairfield was set at the current site of Cross Highway in Redding. That survey affects areas of Easton down to the present day. In 1667 Captain Nathaniel Seeley had purchased “the lands at the bottom of Aspetuck neck between the Saugatuck and Aspetuck rivers from Crecroes. The Aspetuck Landways Study tells us that Captain Seeley was killed in King Phillip’s Wars but that his descendants were among the earliest settlers of Easton. In 1670/71, the natives Crecroes and James, another native Sachem (chief) signed deeds with the town of Fairfield and the Pequonnocks signed similar deeds with Stratford. This purchase by Fairfield from the natives secured “the last six miles of the town common” of the Native Americans’ land holdings in the area for the sum of 36 pounds sterling. Fairfield’s purchase included what is now northern Fairfield, Easton, Weston, and southern Redding. The Stratford purchase included what is now Shelton, Trumbull, Monroe, and eastern Easton. These remote northern areas were not settled for quite a few years. Shortly after the signing of these deeds transferring ownership of the lands from the natives to the settlers, the local government defined what were called The Long Lots. This followed an English practice of dividing fields into long narrow strips but this was on a much larger scale, with those strips of land reaching 10 miles inland, covering the areas that are now Westport, Fairfield, Weston, Easton, and southern Redding. The lots were distributed to local proprietors based on their tax payments and varied greatly in width from almost 900 feet wide to a just more than 30 feet wide. They reached from a little bit north of the current location of The Post Road in Westport, inland to the rear of Fairfield at the current location of Cross Highway in Redding, and from the Norwalk-Westport line east to what was then the Fairfield-Stratford line, now the boundaries of Fairfield-Bridgeport, Easton-Trumbull, and Easton-Monroe. That eastern line was along the current locations of South Park and North Park Roads in Easton. The Easton-Trumbull-Monroe line now runs a bit farther east than those roads, following the Mill River north of Easton Reservoir. There were no surveys done at that time and expectation was not that these properties would be quickly settled. But a landed elite was created and this played an important role in the economics of the Colonial era in our area. The Aspetuck Landways Survey tells us that there was little coinage at the time so ownership of land became a basis for credit and wealth and led to the existence of Colonial Land Banks. Upright highways, those running south to north from near the coast going inland, were mandated by 1692 but were not immediately surveyed. We are told that due to poor upright highways early in the 18th century, Weston did not begin to be settled until 1725. By 1709, a cart track existed from Fairfield on its way to Danbury, running along what is now Redding Road through Fairfield to the site of the Aspetuck River, and then following the river north, still along Redding Road to it’s intersection with Black Rock Road where it then continued to follow the river north. This came to be called “Country Road.” A map below shows the “upright highways” along with the “cross highways,” the roads that ran east and west. >From Charles Burr Todd's "History of Redding"
Nathaniel Seeley was the son of Robert Seeley of London and Wethersfield, Connecticut. Born in London, he resided in New Haven in 1646 but later removed to Fairfield by 1657. In 1667 he purchased land at Aspetuck Neck between the Saugatuck and Aspetuck Rivers from the sachem Cockenoe. Seeley was a sergeant in 1674 and the following year promoted to captain of the Fairfield County Dragoons and lieutenant of the Third Company of Robert Treat’s Connecticut Regiment. He and twenty of his unit died at the Narragansett Swamp Fight in December 1675. Authorities subsequently granted Seely’s widow two hundred acres of land at Fairfield. Donald Line Jacobus, History and Genealogy of the Families of Old Fairfield, Vol. 1 (Fairfield, CT: Daughters of the American Revolution, 1943), 525. Commemorative Biographical Record of Fairfield County, Connecticut (Chicago: J. H. Beers & Co., 1899), 541. Elizabeth Hubbell Godfrey Schenck, The History of Fairfield, Fairfield County, Connecticut, Vol. 1 (New York: J. J. Little & Co., 1889), 136. Bodge, Soldiers in King Philip’s War, 183, 191. Granted by the Town unto Mr. Winthrop at a general town meeting held August the 29th, 1653, the high rock or hill above Mystic, called Lantern Hill, with the Great Swamp beyond it and the land betwixt the swamp and the said hill, and the pond by the hill side. Copy: A true copy of the record, examined per Edward Hallam,Recorder. Henry Jackson, mill owner, probably migrated from England to New England in 1635. He settled in Watertown, Connecticut, in 1637 and moved to Fairfield Country in 1648, where he established a mill. After selling the mill to Samuel Morehouse in 1653, he moved to Poquannock (i.e. Fairfield), where he bought a home and lot from Thomas Wheeler, Jr., and where he negotiated and witnessed the land agreement between the town of Fairfield and the Poquannock Indians in 1657. He was made an assistant of the Connecticut General Court in May 1658. Two years later, the Court appointed him to settle a land dispute between the Indians and settlers of Norwalk. He left a will dated Nov. 11, 1682. Elizabeth Hubbell Schenck, The History of Fairfield, Fairfield County, Connecticut, from the Settlement of the Town in 1639 to 1818 (2 vols., New York: [s. n.], 1889-1905), vol. 1, 97, 104, 110, 382-3; J. Hammond Trumbull, “A Sketch of the Life of Thomas Lechford,” Transactions and Collections of the American Antiquarian Society (Worcester, Mass: American Antiquarian Society, 1820-), vol. 7 (1885), 192. John Goodsell (Yale 1724) was the youngest son of Thomas Goodsell and Sarah Hemingway, East Haven residents whose property abutted Quinnipiac land. Sarah was the elder sister of Rev. Jacob Hemingway. Ordained in 1726, he was a preacher at Stratford and Greenfield, Connecticut until a sickness motivated his retirement. Dexter, Biographical Sketches of the Graduates of Yale College. The first long lot in what is now the village of Georgetown was known as the Osborn long lot granted to Richard Osborn for military service in the Pequot Indian War. This was bounded on the west and northwest by the then Norwalk, now Wilton line and came to the boundary rock in the Norwalk River. This sec-tion is in the Weston part of Georgetown. It has been said that Richard Osborn built on the Osborn long lot at an early date but this has not been proven. The first settler we have record of who built on this section was William Osborn, who built a log house in 1734 on or near where the Gregory Osborn house now stands. (This house is now owned by William E. Osborn of Westport, a direct descendant of Richard Osborn, the first owner of the land.) Later members of the Osborn family built here, giving it the name of Osborntown.